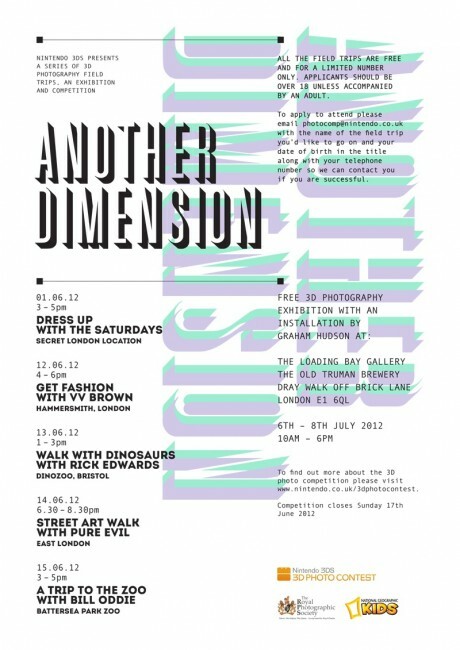 This June and July, Nintendo presents Another Dimension, a series of special events, field trips and an interactive gallery installation by Graham Hudson at the Loading Bay Gallery, using 3D photography with the 3DS console. This series of events are designed to explore the concept of 3D photography, with field trippers being invited to submit photos of their experience, when the best ones will be used as part of the final installation. Thursday 14 June, the graphic artist Pure Evil will lead a street art tour of east London, beginning at his gallery on Leonard Street.